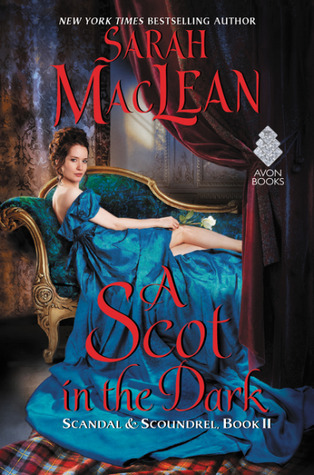 A Scot in the Dark by Sarah MacLean is the second book in the Scandal & Scoundrel series. Lily and Alec were at odds from the start. He didn't want to be there, and she definitely didn't want him there. These two have loads of chemistry though, so all that anger makes for some steamy scenes once they start to get over themselves. Lily's thoughts on women and society are ahead of her time. Of course, she's had a little help developing these beliefs with her own scandal brewing. Like the other books in this series, there's never a dull moment. You don't have to read the books in this series in order, but I definitely recommend that you do read them. A ward. Worse, an English ward. One would think Settlesworth would have told him about that bit. One would think that among the dozens of homes and scores of vehicles and hundreds of staff and thousands of tenants and tens of thousands of livestock, Settlesworth would have thought it valuable to mention the existence of a single young female. 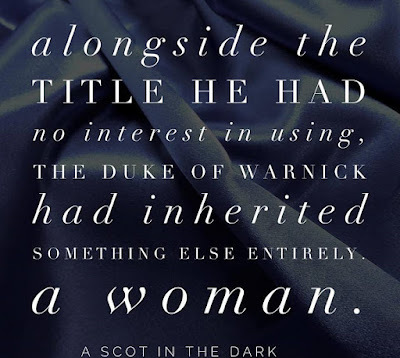 A young female who, despite her utter lack of propriety on paper, would no doubt swoon when she came face-to-face with her Scottish guardian. In four and thirty years, he’d never met one who didn’t widely, loudly and ridiculously threaten the behavior. But Settlesworth hadn’t mentioned the girl, not even in passing, with a “By the way, there’s a ward, and a significantly troublesome one at that.” At least, he hadn’t mentioned it until she’d been so troublesome as to require Alec’s presence in London. And then, it was Your Grace this, and scandal that, and you must come as quickly as possible to repair her reputation in conclusion. So much for Settlesworth being the best solicitor in history. If Alec had any interest in aiding the peerage, he’d take out an advertisement in the News of London to alert them to the man’s complete ineptitude. A ward seemed the kind of thing a man should know about from the start of his guardianship, rather than the moment the damn woman did something supremely stupid and ended up in desperate need of rescue. If he had any sense, he’d have ignored the summons. But apparently he lacked sense, all told, and Alec Stuart, proud Scotsman and unwilling twenty-first Duke of Warnick, was here—on the steps of number 45 Berkeley Square, waiting for someone to answer the damn door. He considered his watch for the third time in as many minutes before he set to knocking once more, letting all his irritation fall against the great slab of mahogany. When he completed the action, he turned his back to the door and surveyed the square, perfectly manicured, gated and just blooming green, designed for the residents of this impeccable part of London and no one else. The place was so damn British, it made his skin crawl. Younger sisters were clearly a punishment for ill deeds in former lives. And current ones. He crossed his arms over his chest, the wool of his jacket pulling tight across his shoulders, constricting him just as the architecture did, all ironwork and stone façade. He hated it here. England will be your ruin. Next door, a gaggle of women exited number 44 Berkeley Square, making their way down the steps to a waiting carriage. A young lady saw him, her eyes going wide before she recoiled in shock and snapped her gaze away to hiss a whisper at the rest of the group, which instantly turned in unison to gawk at him. Alec went instantly cold as the group tittered its amusement. Ignoring the wash of fury that came over him at the assessment, he returned his attention to the door. Where in hell were the servants? “She’s probably renting rooms in there,” one of the girls said. “And other things as well,” came a snide reply. “She’s outrageous enough for it.” What on earth kind of scandal had the girl gotten herself into? Settlesworth’s letter had been perfunctory in the extreme, apologizing for not apprising him of the existence of the ward and laying the girl at Alec’s feet. She is at the heart of a scandal. A quite unsurvivable one, if you do not arrive. Posthaste. He might hate all things English, but Alec wasn’t a monster. He wasn’t about to leave the girl to the damn wolves. And, if the she-wolves next door were any indication, it was a good thing he was here, as the poor girl was already their meal. He knew what it was to be at the hands of Englishwomen. Resisting the urge to tell the women they could pile into their carriage and drive straight to hell, he raised his fist to pound once more. The door opened in an instant and, after impressively recovering from his shock, Alec glowered down at the woman standing before him, wearing the drabbest grey dress he’d ever seen. He imagined she was no more than five and twenty, with high cheekbones and porcelain skin and full lips and red hair that somehow gleamed like gold despite the fact that she was inside a dimly lit foyer. It was as though the woman traveled with her own sun. Drab frock or no, it was not beyond hyperbole to say she was easily the most beautiful woman in Britain. Nothing made a bad day worse like a beautiful Englishwoman. “It’s about bloody time,” he growled. It took the maid several seconds to recover from her own shock and lift her eyes from where they had focused at his chest up to his face, her eyebrows rising with every inch of her gaze. Alec was transfixed. Her eyes were grey—not slate and not steel, but the color of the darkest rainclouds, shot through with silver. 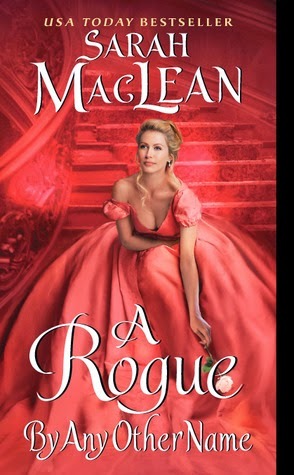 He stiffened, the too-small coat pulling tight across his shoulders, reminding him that he was in England, and whoever this woman was, she was irrelevant to his interests. With the exception of the fact that she was standing between him and his immediate return to Scotland. One red brow rose. “I shall do no such thing.” She closed the door. Alec blinked, surprise and disbelief warring for a fleeting moment before they were both overcome by a supreme loss of patience. He stepped back, sized up the door, and, with a heave, broke the thing down. It crashed to the foyer floor with a mighty thud. The question spurred them into action, sending them fairly climbing over each other to enter their carriage. Satisfied, Alec returned his attention to his own house and, ignoring the pain in his shoulder, crossed the threshold. Alec resisted the urge to deny the words. He had spent the majority of his adult life proving that he was not coarse. Not rough. Not a brute. He refused to reveal his shock. While he had little to no experience with aristocratic servants, he was fairly certain that they did not make a habit of sniping at their masters. Nevertheless, he did not rise to the bait, instead taking in the impeccable home with its broad, sweeping center staircase, stunning and massive oil landscapes on the walls, a touch of gilt here and there, indicating modernity rather than garishness. He turned in a slow circle, considering the high ceilings, the massive mirrors that captured and reflected light from the windows high above, casting the whole space in natural light, and offering a glimpse of a wide, colorful carpet and a roaring fireplace through a nearby open door. It was the kind of house that should belong to a duke with impressive pedigree, no doubt decorated by some previous duchess. Was there a previous duchess? 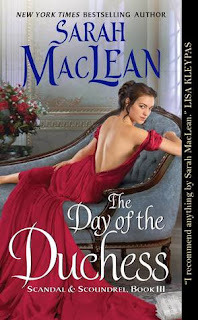 With seventeen dead dukes, Alec would bet there was more than one previous duchess. He growled at the thought. All he needed was a widow to deal with on top of the scandalous ward and the petulant staff. The impertinence trailed off, but Alec heard the unspoken worlds. Beastly. Coarse. His ward was not the swooning type, after all. He didn’t mean to hear the word. But somehow, standing here, with this impeccable Englishwoman in this impeccable English town house in this impeccable English square, wearing an ill-fitting suit, barely fitting in the open doorway, feeling big and out of place, he couldn’t help but hear it. Couldn’t help but feel it, close and unsettling, like the tight cravat around his neck. How often had he heard it from beautiful women? Whispered in awe, as though they were too busy imagining the fine, deep notch he would make in their bedposts to keep their innermost thoughts to themselves. When one came in the size he did, women tended to desire it, like a prize. A bull at the county fair. The word honored their desire even as it demeaned his own. Just as it had demeaned him on his mother’s lips, marking her regret as she’d spat it at him— always too large to be fine enough for her. Too big to be worthy of her. Too coarse. Too Scottish. Too much a reminder of her disappointing life. She’d loathed his size. His strength. His inheritance from his father. Loathed it so much that she’d left, that single word her parting gift to her only son. And so, when he heard it here, in this place, on the lips of another beautiful Englishwoman, with such thorough disdain, he was unable to avoid it. A vision flashed, this stunning woman laid across a bed, hair spread like fire and gold across white linen, long limbs beckoning, pink lips parted. Desire shot through him like pain, and he forced himself to remember his place. He was her guardian. She was his ward. And English at that. She was not for him. The anger changed to something else, gone so quickly that he might not have recognized it if it were not so unbearably familiar to him. And in her shame, in the way it bore the shadow of his own, he instantly regretted his words. He watched her for a long moment—taking in her straight spine, her square shoulders, her high head. The strength she should not have, but carried like honor, nonetheless. “We should begin again,” he said. “I would prefer we not begin at all,” she said, and turned away from him, leaving him in the hallway, with nothing but the sounds from the square beyond floating through the permanently open doorway to keep his company. Have you read the other books in this series yet? 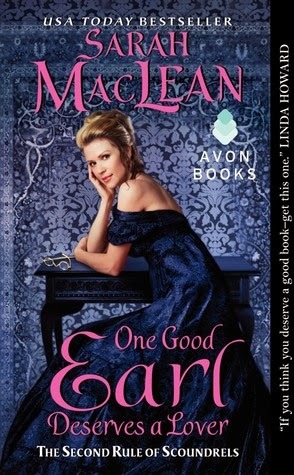 Check out my reviews of more books by this author! 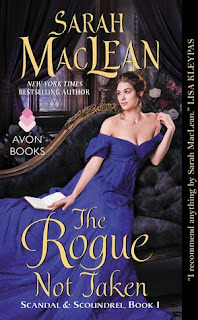 To learn more about Sarah MacLean and her books, visit her website. 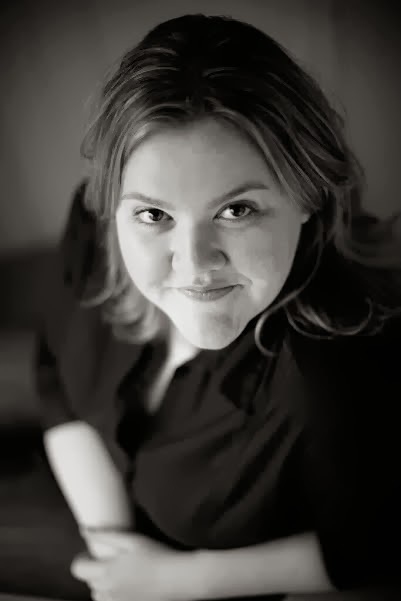 You can also find her on Goodreads, Facebook, and Twitter.